Delivery from £5.00 to United Kingdom in 5 - 11 working days. 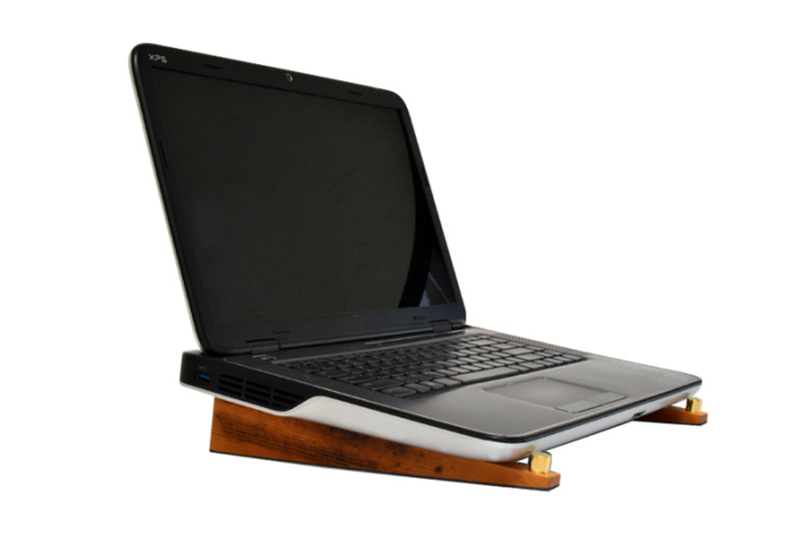 Designed to improve the ergonomics of your laptop by elevating the screen improving posture and presenting the keyboard at a naturally comfortable position. This elegant product is made from Pitch Pine which originally served as a church pew for the parishioners of St Marys Church in our home town of Cardigan, West Wales. It is believed that the pew dates back to the mid 1800’s based on its style and construction. Some of the timber bears the scribed marks of naughty children sitting at the back of the church (these are the special pieces). The Pitch Pine has a wonderful deep contrasting grain with a rich golden hue. The timbers natural beauty is accentuated by our homemade 100% natural beeswax polish. The end pieces are individually machined from solid brass and expertly hand polished by our good friends at purebrass.co.uk. The base is covered in real English leather cut to fit from a full hide which provides grip and protects the surface from scuffs. Beautifully packaged in a sleeved card tube with a full description of the timber and its history. A perfect gift for Christmas or Birthdays.